So, I found a wonderful reason to bake (cause I always want an excuse to bake) without feeling guilty about making large quantities of dessert for myself. A few really clever people who help run The Greenpoint Soup Kitchen thought up a way to include home-baked desserts on their menu, and in the process get more volunteers involved at the soup kitchen who wouldn't otherwise have had the time to help out. Thus, Dessert Corps was born, a team of volunteers who regularly sign-up to bake the assigned dessert for the week, when they have the time. This concept is really great for baking addicts like me who want a reason to indulge their crazy need to bake, and do something good for the community in the process. A win-win situation. I really hope that other soup kitchens around the city implement similar projects. There are so many baking fiends out there that, it shouldn't be hard to find volunteers in most neighborhoods. For more info, check out their blog: http://craigskitchen.wordpress.com Back to the oven...this week I signed up for brownies. In the past, I have steered clear of making brownies for others, having always failed to find a recipe that seemed to deliver the type of fudgey-chocolately brownie I wanted. I've tried recipes with a twist (adding coffee or banana) that all seemed intriguing, but the classic is what I wanted to master. I've tried recipes that utilized different types of chocolate, such as bittersweet, unsweetened, or cocoa powder, but there was never a clear winner (except maybe a clear loser, cocoa powder). I've also tried recipes that required an obscene amount of expensive chocolate, thinking that would surely be a winner for a chocoholic like myself, but the results weren't worth the expense. Why was it so difficult? Then I read an article from Cook's Illustrated, where an in-depth analysis of what was needed to concoct the perfect brownie was undertaken. Of course, I had to test their theory. Their attention to detail may have paid off in coming one step closer to perfection. I've tested their method three separate times so far. I've varied the brand of chocolate and the amount of sugar. 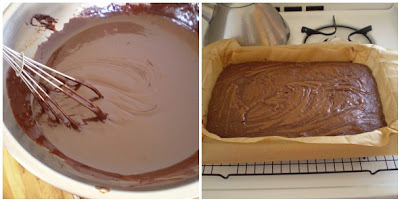 The first time I made it, I pretty much followed the recipe verbatim, and used a higher quality chocolate. They came out super fudgey, almost gooey (possibly from being slightly under cooked) and a tad bit too sweet for my taste. I'm talking possible sugar shock sweet. Still, to my surprise people at work went gaga for them. I was flattered...but I was still not satisfied. I'm a perfectionist when it comes to my sweets. I promised my office taste-testers a few needed tweeks and another batch. Round-two, I used a smaller pan (8-inch, rather than the 13x9 inch) to have a higher brownie. I also decreased the amount of sugar by a bit and made sure not to under cook them. I thought they looked much better, although they received a much more lackluster reaction. Hmmm...stumped. Still through all this, this recipe is the closest I've ever come to a batch of brownies I can proudly offer up, even if the voice inside my head still thinks they're not perfect. This is one of those things I think I'll always be wondering what else is out there...but until I find it, these will do nicely. Better-than-Before-Brownies Adapted from Cook's Illustrated The original recipe calls for cake flour, which should lead to a more delicate texture. I have read that cake flour is treated with chlorine, so I prefer not to use it. A quick substitution is 1 cup AP Flour minus 2 tablespoons. two pieces one going the length and the other going the width of the pan. This will help lift the brownies out of the pan. (If using foil, remember to butter or spray it to prevent sticking). Set up a large bowl over a pot of boiling water (or use your double-boiler) and place the butter and chocolate in to melt. Keep an eye on it and stir frequently to prevent burning. When mixture is completely melted, whisk in sugar slowly. Next, whisk in eggs, one at a time. Then whisk in vanilla. 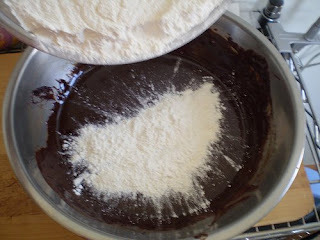 Fold in flour mixture in three additions, folding and blending until batter is smooth. Pour batter into pan and spread into corners and smooth out the surface. Bake for 30-35 minutes, or until a toothpick comes out almost clean (just a few crumbs is perfect). Cool on a rack until completely to room temperature. Then lift brownies out of pan and cut into pieces. Note - If you try to cut them to soon they will be a mess and the insides will stick to your knife. Patience Grasshopper.